Balance of Current Account shows to what extent national (private and public) savings covers (private and public) investment of a country. Current account deficit emerges when the supply of savings is not enough for the funds demanded for investment and this demand is covered by short or long term capital inflows. Ranging from an unequal distribution of natural resources to unequal distribution of power grounded in colonial history, a wide spectrum of possible causes explain why some countries have current account surpluses and others deficits. 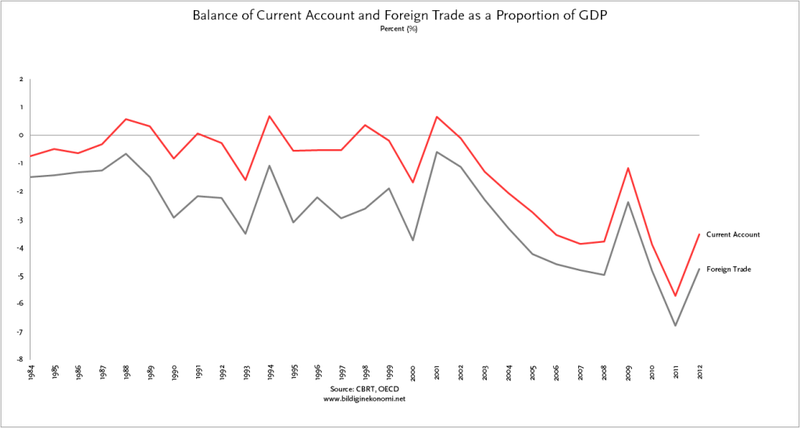 When the size of current account deficit (or surplus) with respect to GDP grows, this indicates that the country is more dependent on and exposed to the dynamics and oscillations of global markets. This also entails increased fragility. A country with a large deficit, especially if the deficit is growing, loses credibility and begins to have difficulty in raising long term net capital inflow. A country with a large surplus, on the other hand, searches for investment opportunities in foreign markets. Yet, even in this case, this country will find itself dependent on and exposed to the dynamics and cycles of the global markets. The inflation dataset is downloaded from The Central Bank of The Republic of Turkey, “GENERAL STATISTICS” link. GDP dataset is downloaded from the OECD website, “Gross domestic product (GDP)” link.